Somalia (Somali: Soomaaliya; Arabic: الصومال‎ aṣ-Ṣūmāl /soʊˈmɑːliə/ soh-mah-lee-ə), officially the Federal Republic of Somalia (Somali: Jamhuuriyadda Federaalka Soomaaliya, Arabic: جمهورية الصومال الفدرالية‎ Jumhūriyyat aṣ-Ṣūmāl al-Fiderāliyya), is a country located in the Horn of Africa. It is bordered by Ethiopia to the west, Djibouti to the northwest, the Gulf of Aden to the north, the Indian Ocean to the east, and Kenya to the southwest. 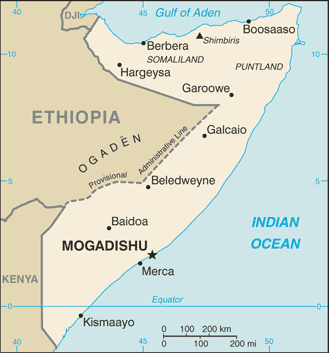 Somalia has the longest coastline on the mainland, and its terrain consists mainly of plateaus, plains and highlands. Hot conditions prevail year-round, along with periodic monsoon winds and irregular rainfall.